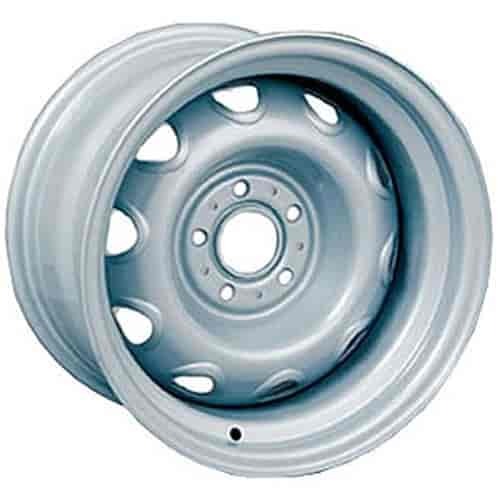 Wheel Vintiques 56-Series Chrysler Rallye Wheel Size: 15" x 10"
These Chrysler Rallye Rims are available powder coated silver with standard 5 x 4-1/2'' (56 Series) or the 5 x 4'' (61 Series) bolt patterns. They are also available chrome plated with the standard 5 x 4-1/2'' (49 Series) bolt pattern. They feature a factory appearance like the originals, but unlike other manufacturers wheels these are able to use the factory Chrysler hubcaps, acorn/conical lug nuts, and trim rings (all sold separately). .
Wheel Vintiques 3003-B - Trim Ring 15 x 7"